Precious metals futures ended lower Tuesday for a second day this week. 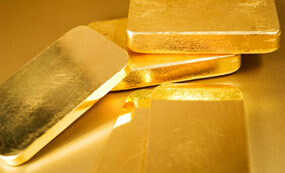 Gold settled at a near three-week low while silver closed at an almost seven-week low. Gold for April delivery declined $7, or 0.5%, to settle at $1,329.50 an ounce on the Comex division of the New York Mercantile Exchange. The settlement was the weakest since Jan. 18. "When the dollar and Treasury yields went up, gold had no place to go and it wasn’t the safe haven that everybody was looking forward to. When the stock market sold off, the dollar seemed to be getting all the activity instead of gold," Reuters quoted Walter Pehowich, executive vice president of investment services at Dillon Gage Metals. Gold futures traded from a low of $1,328.40 to a high of $1,349.30. They dipped less than 0.1% on Monday. Silver for March delivery fell 9.1 cents, or nearly 0.6%, to settle at $16.58 an ounce. The close was the lowest since Dec. 22. Silver futures ranged from $16.54 to $16.96. They lost 0.2% on Monday. April platinum shed $1.20, or 0.1%, to $994.30 an ounce, trading between $987 and $1,002.90. Palladium for March delivery sank $30.45, or 3%, to $1,002.50 an ounce, ranging from $997.20 to $1,028.15. Gold declined $2.20, or 0.2%, to $1,331.40 an ounce. Silver fell 7 cents, or 0.4%, to $16.805 an ounce. United States Mint bullion sales were unchanged. Below is a sales breakdown of U.S. bullion products with columns listing the number of coins sold during varying periods. This has nothing to do with this article but maybe someone will read it.I was going thru some Jefferson nickels and found a 2007D that had no E in the E Pluribus Unum above thedome on the reverse. It appears the die had been polished because if you magnify it under light you can see the faint outline of the E. Has anybody else run across this. I collect nickels but this one is newto me. Thank all you people for the info all of you supply. Is this platinum 1 oz gonna drop in price from $1420 because platinum is under $1000/oz now? When will that price drop happen? Plat did drop…..unreal they are selling ’17 Buffs….? How about some others like the Boys Town in the melting piles… or those pesky Prez$ maybe release them, or let the 2% buy $1,000,000 face with 15% off, just like a tax cut! Thank you ever dropping precious metals spot. I planned to purchase some more investment bullion for the beginning of next month but took advantage of the hugh drop today. What a great deal. I feel for anyone that did not cash in in the palladium spike, I have a feeling it is going to drop well below platinum again, and stay there for a long time. Palladium does not have the security of platinum / gold and silver. I do agree with you CHAS, precious metals investment is designed for the 2 per cent to make the big bucks. I will always take a quick two hundred dollar profit, but man would I like to be able to experience a quick two million dollar profit. Mouse Palladium is a strange beast, Rose cause plat was too high$ now almost = but with the APdEagle there is demand for the metal. I sold some @ 930 & missed another $100, still got a bunch I got 10y ago <$2oo an oz…. Also did sell ONE golde Eagle for $1,535 when gold was UP UP to say I did, should have sold more & bought Pd!…… or Nexflix stock…. Chase – Holy smokes, Palladium back in the day at 2 bucks an ounce, that’s awesome, I hope you are able to drop it for loads of cash. I missed the boat on Palladium, against my better judgement. I thought it would be another rhodium. As Palladium is a bi-product of Platinum mining, I feel that when the large car manufactures run low on Palladium that they will purchase Platinum as it is a lower price and does the same job – further decreasing Palladium value. Just my own personnel speculation.